If you're like me, and you scare easily, then perhaps you should rethink entering Universal's Halloween Horror Nights, as they've taken the screams beyond eleven this year, creating one of the scariest haunted playgrounds found in America. Sure, there are a couple of backwoods Spook Houses sprinkled across the states that will provide you with genuine scares, as authentic hillbillies attempt to collect your blood in buckets. But if you want to stay safe and actually live through the night, Halloween Horror Nights is definitely the best venue for the buck. But the key is keeping your limbs intact at all times. With maniacs, killers and deranged clowns hiding around every corner of this Hollywood themed park, that might be difficult. Danger lurks in every shadow. I'm extra cautious, and I've learned how to maneuver these mazes with ease and precision. Sure, I still scream like a sheep heading off to slaughter, but I've learned a few tips in my time traveling through what Universal has in store. Though, often enough, they still manage to shock me into an eye-widening, mouth agape stance as I'm paralyzed by unsubstantiated fear. And that's my biggest problem. These scare actors know exactly whom to terrorize, so you got to play it cool. 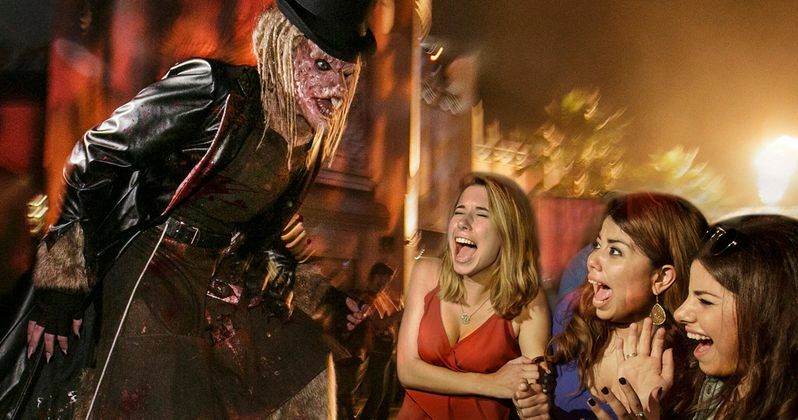 But that's going to be extremely hard this year, as Halloween Horror Nights has lined up some of the best new mazes and attractions since the Halloween tradition launched in 1991 under the name Fright Nights. Slaughter Sinema brings an old school Drive-In theater to life with it's own creepy movies. The Poltergeist maze is hands down one of the best the studio has ever done, and Stranger Things brings you right into the fan-favorite TV show to battle Demogorgons while running alongside Dustin and cheering Eleven on as she defeats the beast. Each new walk through will have your teeth clinched, as you shiver through to the end. But don't worry. You can survive this night. 1 Never let them see you scream. The most important survival tip when visiting Universal's Halloween Horror Nights is, no matter how much you want to, don't ever let the scare actors know your are afraid. Because they will swarm you like kittens to catnip. These are professional thespians. And they can sense when someone is truly scared. And they will pick out the weak and go for the jugular. They best thing to do, if you want to go unnoticed, is pretended to be unfazed. If you're like me, a guy who can't hide his emotions when it comes to being terrified, it takes a lot of practice. You have to stare straight ahead, stoic, ignoring the loon with the working chainsaw. This will become increasingly hard as you traverse the Toxic Tunnel, a long deep path you must cut through to get to other attractions. Don't let them smell the terror coming off your body. Duck, jive, play along just a little bit and they will leave you alone for the most part. It's when the Terror Tram breaks down, and you are forced to deal with Hollywood Harry's crazy friends that things really get out of hand. Perhaps, if you're too much a scaredy cat, you should think twice about sitting this one out. 2 Bring your best pair of running shoes. No matter how much of a brave Halloween solider you imagine yourself to be, Universal has really pulled out all the stops this year, and be you big or small, something, somewhere, hiding in the darkest, dankest corner, is going to crawl into the slivers of light provided by the attractions and make you scream in terror. And isn't that really what it's about? To remind us we're alive in this big, black hole? Just don't get too comfortable. At some point in the night, you're going to feel like bolting for the exit. And you can't do that in high heels or fancy leather business shoes. Leave that to Claire Dearing over on the renovated Jurassic World ride that isn't opened yet. With knife swinging boogeymen awaiting you at every turn, it's way to easy to fall. And then, you're a goner. Also, you're going to be doing a lot of walking. Nearly every attraction requires it. Even the Terror Tram, though it screams ride, they make you get out and walk through a terrifying landscape, and the faster your can free yourself from this nightmare, the better. When heading to Halloween Horror Nights, you definitely want a comfortable pair of shoes. Oh, and don't forget to powder your unmentionables before hand. You're going to get sweaty. The aftermath of raw chaffed thighs and wrecked feet is scarier than anything you'll encounter in the park. 3 Express is the best way to fly. I'm not shilling for Universal when I say this, I'm simply speaking from experience. I know the express pass is much more expensive than a regular pass. But once you get inside and see some of these lines, you'll realize it's worth it. With the express pass, you can shoot to the front of the line, and do every maze almost instantaneously. Sure, there's some wait time, but not much. This year, Universal has introduced two of it's best mazes of all time with Poltergeist and Stranger Things. And the Halloween 4: The Return of Michael Myers maze is pretty great, too, if you ever wanted to find yourself in the middle of a shoot out between a deranged killer and his gun wielding doctor. On opening night, these lines were insane. The wait time was nearing three hours in some instances, and I was told by a park employee that as Halloween gets closer, more people are entering the park, which means even longer lines and increased wait times. If you can afford it, the Express pass will become your best friend. And next year, remember that the earlier you go in September, the better the experience is and the less crowds you have to deal with. But I know, I know, that's like opening all your Christmas presents the day after Thanksgiving. It just doesn't have the same kind of sting to it. 4 Fuel up and keep it hydrated. Eating and drinking at any given theme park can seriously ravage your pocket book. But this year, there are so many delightful edibles at every turn. Universal has introduced a Stranger Things menu that is absolutely amazing, and surprisingly not that spendy. Plus, there are a ton of awesome eateries in the Simpsons part of the park. Not to mention all the restaurants around City Walk, if you're in beautiful Hollywood, California. Your best bet is to eat before you really get started into the park. Perhaps you could bring your own snacks, but where is the fun in that? You'll want to have water handy at all times, because you're going to be doing a lot of running. And make sure you use the bathroom when you need to, because there are some big scares, and we wouldn't want to see you walking around with wet pants. Or worse. Don't go hungry. Prepare to keep your gut protected and your throat coated at all times. Otherwise you might perish and turn into a pile of bones. Though, I'm sure they'll get put to good use in this nightmare factory. 5 Watch a ton of scary movies before entering the park. Or don't. This can really go two ways. There are plenty of horror survival tips to learn, live, and abide by hidden in just about any given horror movie. You can learn to fight off chainsaw wielding giants watching Mandy. Or how to survive a night on the lake watching Friday the 13th Part 2. But be careful. The new Halloween movie that is in theaters will get you super psyched and paranoid, and you'll be wandering the Scare Zones wondering which actor is going to fall off his rocks first and actually kill someone. It all depends just how deep of a scare you want to achieve. There is a new horror movie out this Halloween season called Hell Fest, which takes place in a spooky land of terrors not unlike Halloween Horror Nights. A serial killer is on the loose and killing Teenage tourists looking for a killer time. This movie is sure to get your blood pumping, and it will be the only thing on your mind as you traverse the mazes and make your way through each new nightmare. It's really about how badly you want to tremble. A lot, watching everything you can get your hands on will do the trick. Not at all, steer clear of all Blu-ray players, VCRs and streaming devices for the foreseeable future. 6 Buy your merch on the way out the door. You want to survive the night. So does your newly purchased merch. Everyone loves a souvenir, and this year, Halloween Horror Nights has introduced some of the coolest T-Shirts and trinkets ever made for the occasion. But you really want to make it to the end of the gate? Resist the temptation to buy early. Sure, fear that they may run out of your size is more terrifying then some of the ghouls awaiting you in one of these new mazes. Buy guess what? This is one of the biggest theme park chains in the world. They are not running out of anything. And you don't want to be stuck carrying a coffee mug through every single scare attraction. Inevitably, some dog faced jackal in overalls is going to come at you swinging a pipe, and you're going to lose your grip on that plastic bag, and so long awesome Eleven keepsake. You can wait until you're near the exit to spend whatever money you have left after gorging on sour apple Squishys and Demogorgon Totchos. You'll think me later, or curse yourself if you're forced to carry a big bag of goodies through the park. You can buy tickets right now at Universal Studios.